University of Chicago Press, 9780226215921, 160pp. Compared to the obvious complexity of animals, plants at a glance seem relatively simple in form. But that simplicity is deceptive: the plants around us are the result of millennia of incredible evolutionary adaptations that have allowed them to survive, and thrive, under wildly changing conditions and in remarkably specific ecological niches. Much of this innovation, however, is invisible to the naked eye. With Wonders of the Plant Kingdom, the naked eye gets an unforgettable boost. 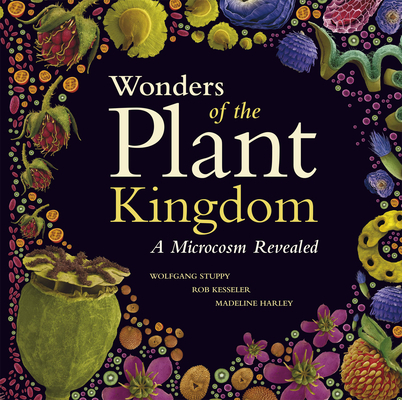 A stunning collaboration between science and art, this gorgeous book presents hundreds of images of plants taken with a scanning electron microscope and hand-colored by artist Rob Kesseler to reveal the awe-inspiring adaptations all around us. The surface of a peach—with its hairs, or trichomes, and sunken stomata, or breathing pores—emerges from these pages in microscopic detail. The dust-like seeds of the smallest cactus species in the world, the Blossfeldia liliputana—which measures just twelve millimeters fully grown—explode here with form, color, and character, while the flower bud of a kaffir lime, cross-sectioned, reveals the complex of a flower bud with the all-important pistil in the center. Accompanying these extraordinary images are up-to-date explanations of the myriad ways that these plants have ensured their own survival—and, by proxy, our own. Gardeners and science buffs alike will marvel at this wholly new perspective on the world of plant diversity. WolfgangStuppy is a seed morphologist at the Royal Botanic Gardens, Kew. Rob Kesseler is professor of ceramic art and design at Central Saint Martins, University of the Arts, London. Together, they are coauthors of Seeds: Time Capsules of Life and Fruit: Edible, Inedible, Incredible. Madeline Harley was, until her retirement in 2005, head of the Pollen Research Unit at the Royal Botanic Gardens, Kew. She is coauthor, with Rob Kesseler, of Pollen: The Hidden Sexuality of Flowers. "The pseudocolored electron micrographs that grace the pages of this striking book reveal the dazzling array of adaptations in the plant kingdom. Featuring a wide range of seeds, spores, fruits, and pollen, the accompanying text offers a straightforward primer on plant reproduction as well as a discussion of the Royal Botanic Gardens' efforts to protect plant biodiversity." A "Recent Publication of Interest": "Spectacular color photographs and hand-colored scanning electron micrographs are accompanied by short blocks of text explaining botanical phenomena. The text focuses on flowers and their structures and on ecological interactions (pollination and seed dispersal)."